Our second compilation of home cassette-recorded readers’ contributions is bigger and much more varied than our first, with lots more from Editors past and present and other friends of C&S. We’re extremely pleased to oiler three splendid selections from all-time favorite Louis Killen (although there’s a glitch in one cut) as well as the extraordinary Crane system Duet playing of French maestro and former Anche Libre editor There are even two saucy tunes with our Bailin Wire Correspondent Stinson Behlen. Concertina historians will be able to hear old Wheatstone Aeolas on cuts 12, 13 & 14 on Side One, and on cut 7, Side Two! 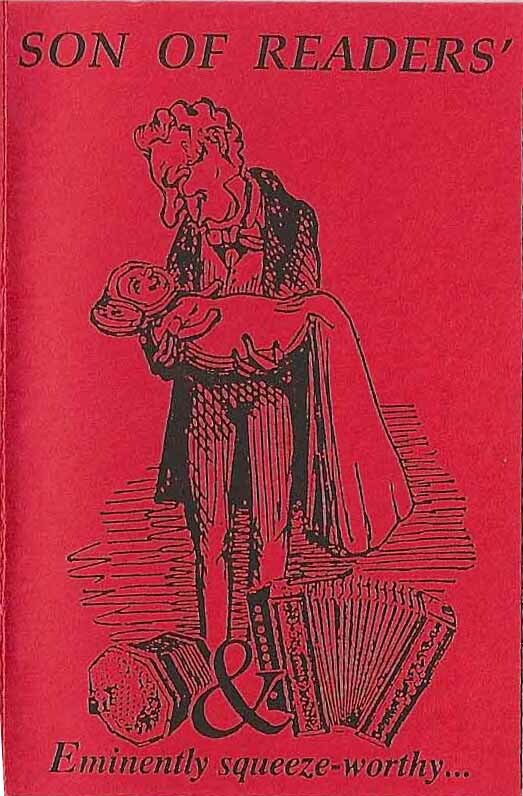 The Baritone Aeola featured on the cover of Frank Butler’s tutor The Concertina>is played on cut 6, Side One. We thank everyone for their generous contributions. As is expected with mostly home-recorded tapes, the audio quality of this Readers’ compilation varies; some of the selections were taped on very primitive equipment Indeed! The six cuts featuring the Editor and John Scurlock, for example, were recorded on the top floor of an old hotel, with clearly audible lumber trucks roaring past in the background. There are some true eccentricities of playing styles here, but generally the musical properties are excellent! In any case, we aren’t too fussy about professional quality recordings here at C&S—it’s the music we’re after! So we hope that YOU will rush to put some of your music on tape (try to use a good chromium oxide cassette though) and send it in for one of our next Readers’ tapes!!! 4. Huitklaffen’s Bridal March/Reinlander (traditional: Sweden/Norway). 7. Bouree a FrankFrank (F. Grimaud). JOEL COWAN(Instruments listed) & JOHN SCURLOCK Jeffries 39-key C/G Anglo). 8. Air/Crossing the Shannon/The Day I Met Tom Moylan/The Reverend Brothers (Jeffries Anglo). 9. The Trout (Shubert,arranged by Frank Butler: with treble English). 10. Ril ganainm (solo, on Dipper 30-key G/D Anglo). 11. London Pride (solo, on Dipper Anglo). 15. Lord Byron’s Favorite Strathspey. 1. The Fox Chase (Jim & Rachel Hall). 4. The Seven Joys of Mary. 6. While Up the Shrouds (C. Dibdin). 7. The Old Virginia Lowlands. 9. It’s a Beautiful Day (O’Hegarty @1973). 10. Banks of Sicily (Hamish Henderson / taditional). 11. Let Your Back & Sides Go Bare(traditional). 12. Over the Waves (9-key, 2-bass, miniature Chinese melodeon). 13. Under the Double Eagle (Chinese 60-bass piano accordion). 14. Lilting Lil (Cilma Ramirez, with Bina foot-pump harinonium). 15. Taking Me Home(John & Deirdre Townley, with harmoniun, 1968). Download all files for this tape (72Mb).